The purpose of this experiment was to determine the effect of different amounts of fertilizer on the survival rate of brine shrimp. I became interested in this idea last year when I did an experiment on the effect of oil on brine shrimp and wondered if fertilizers would affect brine shrimp. I have always been interested in fish and marine life. The information gained from this experiment could show farmers that synthetic fertilizers are harmful to our environment and that they should consider natural fertilizers. My hypothesis was that as the amount of fertilizer in the water increased, the survival rate of the brine shrimp would decrease. 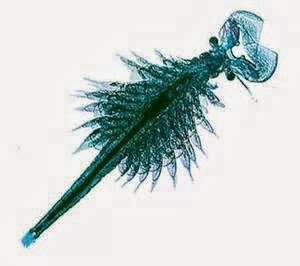 I based my hypothesis on the book Animal Care from Protozoa to Small Mammals, which stated that brine shrimp could digest small amounts of certain chemicals. The manipulated variable was the amount of fertilizer in the water. The responding variable was the survival rate of the brine shrimp. To measure the responding variable, I looked into the jars and when there was no movement in the jars, then all the shrimp were dead. The results of the experiment showed the more fertilizer in the water, the faster the brine shrimp died. The brine shrimp in the control group lived the longest (7+ days average). The shrimp in group number 3 lived the shortest (1 day average). The brine shrimp in group number 2 took 2 days to completely die out on average. The brine shrimp in group number 1 lasted 3 days on average. My original hypothesis was that as the amount of fertilizer goes up the number of brine shrimp would go down. The results indicate that this hypothesis should be accepted, because the brine shrimp in-group 3 died out first and that was the group with the most fertilizer. After thinking about the results of this experiment, I wonder if different types of fertilizer would affect them in the same way. In particular I would test natural fertilizers. If I were to conduct this project again I would conduct many more trials to show better results.